Is your lawn not looking as lush as you’d like, even though you’re doing everything to keep it healthy? Maybe it’s time to consider overseeding. By laying down seed in the spring, you can increase the density of your turf and fill in spaces open to weeds. Here’s how. Why Overseed in the Spring? Most overseeding is done in the fall to add cool weather grasses, giving the lawn a second growing season as warm season varieties go into hibernation. However, overseeding in the spring also gives your lawn a boost by increasing grass coverage in the spring and summer. On average, a blade of grass only lives for around 45 days. During its life, the blade extends roots that in turn grow new blades. As grass matures, this root growth slows until the blades are dying out faster than they’re replaced. After three or four years, this can thin out ground coverage. By planting new seed, the cycle starts over again with fresh growth. 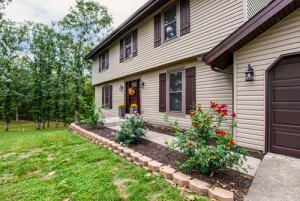 This fills in open spaces, increasing grass density for a lush looking lawn. The new growth also competes with weeds for soil, reducing the need for herbicides. Temperatures aren’t much of a problem for spring overseeding, but you may run into problems with herbicides. Chemicals aimed at crabgrass prevention can hinder new grass growth up to 16 weeks after application, and broadleaf herbicides can stunt growth up to four weeks after application. If you have trouble with either weed, you may want to put off overseeding until the fall. To give your new grass a good start, any soil issues should be corrected before overseeding. Get a soil test, and add amendments to bring the soil nutrients in line with what the grass will need. Avoid using “weed and feed” fertilizers: the herbicides they contain can inhibit new grass growth. Cut your lawn as short as possible without cutting into crowns, and bag the clippings. The remaining grass should have a height under two inches. This exposes the maximum amount of soil for good seed contact. Dethatch the lawn. By pulling back the thatch layer, there will be one less barrier between the seed and the ground. Blade seeders only relieve surface compaction. By aerating your lawn ahead of time, deeper soil compaction is eliminated, making it easier for new roots to penetrate the soil. The seed manufacturer will recommend a range for application density. Go for the maximum amount recommended if the lawn has never been overseeded, and aim for the lower half of the recommended range if the lawn was overseeded in the past couple years. Keep in mind that most equipment manufacturers recommend making two opposing passes when seeding: you’ll need to lay down half the recommended amount with each pass. Lightly water the lawn two to three times per day. This will keep the soil moist without washing away the seeds or promoting mold. Once the seeds start sprouting, switch to watering the same total amount of water once per day. This water will go deeper into the soil, promoting root growth. A high-phosphorus fertilizer may need to be applied with the seed or shortly afterward. Unlike other nutrients, phosphorus, marked “P” on the fertilizer bag, isn’t water soluble, so the new plants can’t access it until their root systems develop. Fertilizers designed for overseeding will include extra phosphorus. Avoid foot and vehicle traffic on the lawn, and hold off on mowing until the new grass is at least two inches tall. Once that happens, you can return to your usual lawn care routine. If you have a seeder from Exmark or JRCO, an Echo yard sprayer or anything other piece of outdoor equipment, chances are, you can get the parts and service you need at Shank’s Lawn. We’re an authorized dealer for a wide range of manufacturers from BCS to Yanmar, which means we sell and support everything you need for lawn care. Visit our shop at 4900 Molly Pitcher Highway in Chambersburg, PA. Need parts and accessories for your equipment? You can order what you need from your browser and have it shipped anywhere in the U.S. or Canada. Just visit www.shankslawn.com. If you need to mow large areas, there’s a good chance that Woods makes a mower deck that’s perfect for your needs: their Batwing cutters lead the market for flexible deck solutions, while their single and multi-spindle cutters make it easy to turn any tractor into a mower. There was just one thing missing: a ditch bank cutter. The new DBH5.31 and DBH6.31 finally fill this niche, offering the reach and flexibility to cut steep slopes. By introducing industry-first features and the largest cutting area to the segment, these attachments are a compelling option for anyone who needs to remove vegetation along roadsides, ditches, and waterways. The DBH6.31 is the only 6-foot wide bank cutter available today, cutting job times when trimming large ditches. If you need something a little more compact, the DBH5.31 is 5 feet wide, but still retains all the features of the 6.31. The PTO drives a pump that operates at 19 GPM at 4,000 PSI. With 40 HP of force at the cutting head, the ditch cutters are the most powerful in their class. Blade tip speed is 14,860 feet per minute with a PTO speed of 540 RPM, and 14,441 FPM at 1,000 RPM. This gives the cutter enough power to slice through plants up to two inches in diameter. If you’ll be using the cutter near its maximum capacity, Woods offers an optional hydraulic cooling system. The only one of its kind on the market, it manages hydraulic temperatures to deliver consistent performance and reduce downtime for difficult jobs. The ½ inch by 4-inch cutting blades are more than up to the task, but sharpening and replacing blades this big can be awkward. Fortunately, these ditch cutters come with Woods’ Quick-Change blade system. This allows the blades to be replaced from the top of the deck using a single ¾ inch wrench. The deck has a 9.4 inch deep cutting chamber and uses a deck top made from 10 gauge (0.135 inches) steel supported by 3 x 4-inch tube frame. A two-inch tubular bumper around the perimeter of the deck protects the attachment in collisions. 5/16 inch chain guards surround the deck to deflect debris flying off of the blade. The built-in hydraulics allow the deck to be pivoted up to 90 degrees both up and down to hug the turf, no matter how steep. A fully hydraulic deck extension arm adds 30 inches of reach, letting the blades reach out up to 152 inches from the tractor. Cutting height can be set anywhere from 2-10 inches. Gauge wheels and a frame-mounted tail wheel can be added, letting you set the cutter against the ground and keep it mowing at a consistent height. When going to and from work sites, the deck can be folded up for a 119-inch transport width with no frame overhang, keeping the tractor clear of nearby vehicles. Both the DBH5.31 and DBH6.31 are designed to be used with tractors rated at 60-150 HP. These cutters attach using Cat 2 and 3 hitches, and they’re quick hitch compatible. They connect to the tractor’s PTO using an ASABE Cat 4 driveline. Counterweights are required for the left side of the tractor. Woods offers a 6-year limited warranty on the gearbox, a 3-year warranty on the spindle, and a one year warranty for the rest of the attachment. Shank’s Lawn Equipment has helped their customers with everything from walk-behind mowers to big commercial equipment like these ditch cutters for over 35 years. If you’re looking to add equipment to your fleet, or need parts and service for your Woods attachments, visit us at 4900 Molly Pitcher Highway, Chambersburg, PA. To get here from I-81, take Exit 10 to Marion and drive East one mile. We also ship parts and accessories across the U.S. and Canada, making it easy to get what you need to keep your equipment in service. To order, visit us online at www.shankslawn.com. The new Woods FZ22-2 builds on their popular compact ZTR, improving everything from the mower’s stability to its maintenance access. 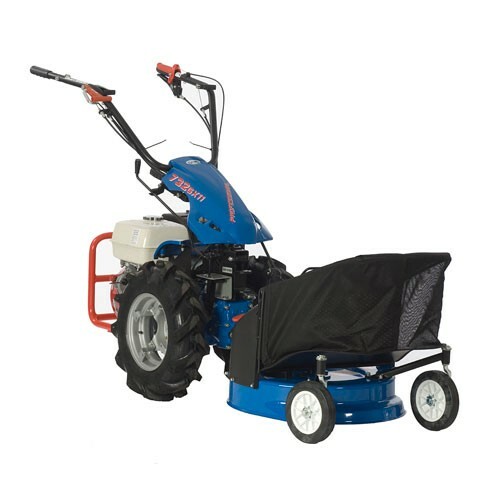 Add in a line of accessories for jobs ranging from moving snow to cleaning pavement, and you have a machine that can do the job of a ZTR and a garden tractor. 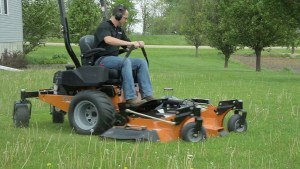 This mower uses a 22 HP Kawasaki FS Series engine mated to a Hydro-Gear ZT-3400 hydrostatic transmission. Together, they’re able to deliver a top speed of 9 mph. The engine comes with a paper air filter and a foam prefilter to keep the engine internals clean, while a rotating grass chopper keeps the outside clean and cool. The transmission uses a spin-on oil filter for easy fluid changes. An 8.5-gallon tank carries enough fuel to run the mower all day. Speaking of serviceability, this updated mower has a new flip-up seat with a built-in support, making it easy to reach the battery. This seat moves forward and back as well as up and down to get a good position for operators of any size, while the lap bar linkage was redesigned to deliver smoother, lighter action for better control. All of this comes in a package with better weight distribution than the outgoing model for better hill stability. 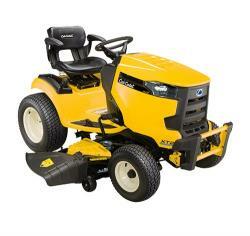 The FX22-2 is available with a choice of 54 and 61-inch wide MX decks. This constructed deck is 5 inches deep and uses Woods’ patented V-Baffle system uses a combination of baffles and welded supports to hug the blades. This gives the MX the same amount of vacuum as a stamped deck. A welded bumper protects the shell from bumps. The deck’s TrueFloat mounting system lets it float front to back and side to side to hug the ground and avoid scalping. Cutting height can be set from 1-5 inches. Each blade is supported by a greasable spindle with three bearings to spread out the load and reduce wear. Where the FZ22-2 really shines is its variety of accessories. ZTRs are usually limited to mowing, but this mower can handle tasks that would normally require a garden tractor. The snow thrower attachment clears a 50-inch swath, has a manual discharge chute that rotates 180 degrees, and a deflector that can be adjusted from the operator’s position. The dozer blade is 60 inches wide and tilts 25 degrees to the right and left. For pavement cleanup, Woods offers two 60-inch power brooms. The FSW6000F rotates manually 30 degrees to the right, while the FSW6000T can rotate 25 degrees left or right and has a built-in electric lift. There are also several add-ons that improve usability when moving. By adding the Powertilt lift, you can easily tilt the deck up to take up less space during transport or to get access to the underside for cleaning. 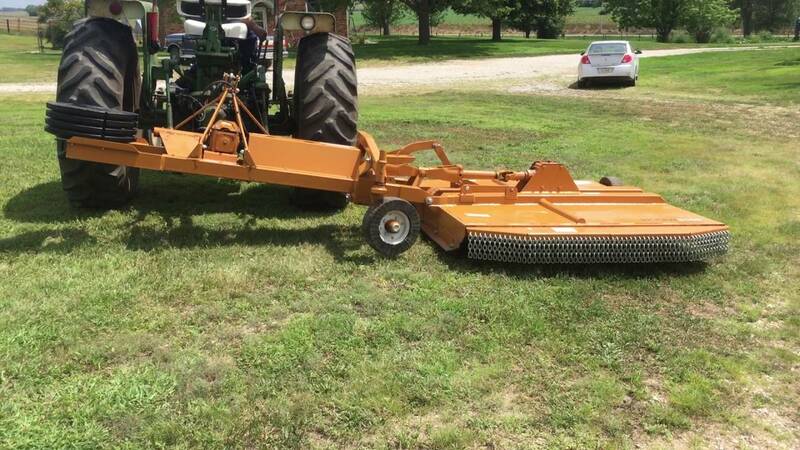 Since the mowing chamber already has baffles, the mulching kit just adds high lift blades and a chute plug to keep grass inside the deck while it’s being chopped up. There’s also a blower-driven grass collection system that actively pulls clippings out of the deck and deposits them into bags with a total of 15 cubic feet of storage. Turf tires standard, but chevron tires available for more grip on hills at the expense of scrubbing. Tire chains are also available for better traction on snow and ice. Kawasaki guarantees the engine for three years, and Hydro-Gear guarantees the ZT-3400 for 6 months. The rest of the FZ22-2 is covered by Woods for two years or 2,000 hours of operation. For over 35 years, Shank’s Lawn Care has helped homeowners and landscape professionals with their lawn care equipment. We’re an authorized Woods, Hydro-Gear and Kawasaki Power dealer, which means we have the parts and support you need to get the most out of their mowers and attachments. If you’re looking for a new ZTR, or you need help with your current equipment, visit us at 4900 Molly Pitcher Highway in Chambersburg, PA. That’s on the south end of town, one mile east of I-81 from Exit 10. We also ship parts and accessories across the U.S. and Canada. To order, visit us online at www.shankslawn.com. 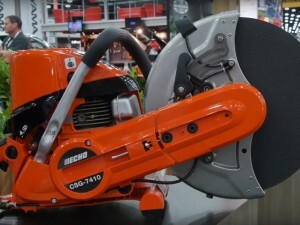 Each year, manufactures gather at the GIE+ Expo to show off the latest in landscaping equipment, from handheld devices to the largest commercial mowers This year, Shindaiwa came to the show with two new trimmers and a new edger, delivering higher performance, lower weight, and better ergonomics. This new trimmer is built to deliver maximum power while keeping weight in check. That starts with a professional grade 30.5 cc two-stroke engine that produces 1.8 horsepower surrounded by a lightweight magnesium fan housing. Power is sent to the cutting head via a flex cable drive to limit vibration, while a 1.62:1 reduction gear increases torque output to cut through thick grass. A bellows intake makes the engine easier to start when hot. Both the loop front handle and rear throttle handle have over-molded grips to shield the operator from vibration. A small profile shield further reduces weight; as equipped, the T302 tips the scales at just 13.7 lbs. As equipped from the factory, this trimmer has a 20-inch wide cutting swath. Available accessories include kits to turn the T302 into a pole pruner, power broom, or brushcutter. The brushcutter kit comes with a bicycle handle for easier control. Shindaiwa also offers high capacity manual heads and heavy-duty fixed line heads for string trimming. This small trimmer shares many of the design features of the T302. 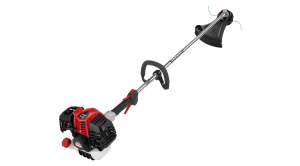 It has the same 20-inch cutting swath, small profile shield and loop handle, but it’s powered by a smaller 25.4 cc two-stroke engine. A Speed-Feed 400 head comes standard and is designed for Shindaiwa’s own 0.095-inch Silentwist spiral line. The aerodynamic shape of this line decreases wind resistance, improving fuel efficiency. As equipped, this string trimmer weighs just 12.4 lbs. The T262 can be used for a variety of lawn cleanup duties thanks to a long list of accessories. Shindaiwa offers kits to convert the trimmer into a hedge trimmer, pole pruner, powered broom, and brushcutter. The standard head can also be swapped out with a heavy-duty fixed line head for cutting thick grass. 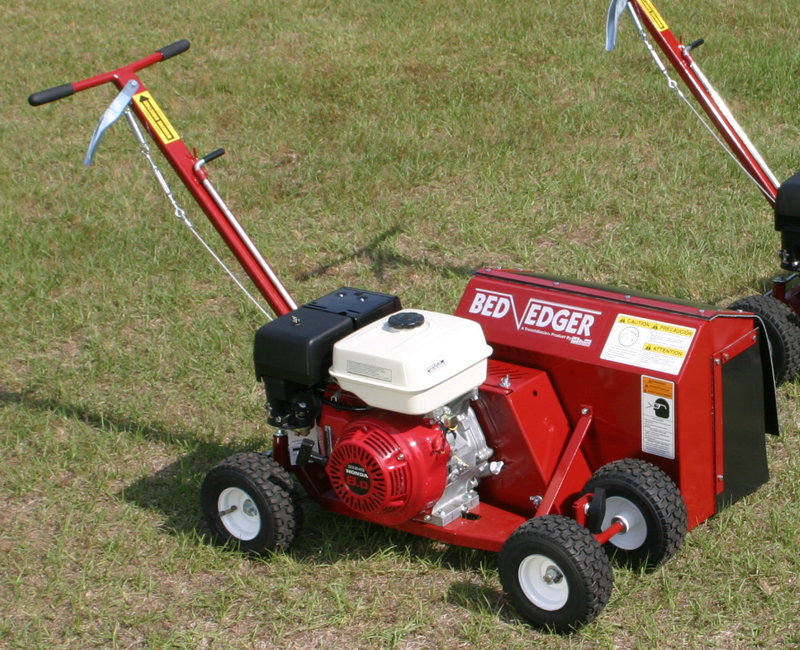 This edger uses the same 25.4 cc two-stroke as the T262 and weighs in at just 12.8 lbs. 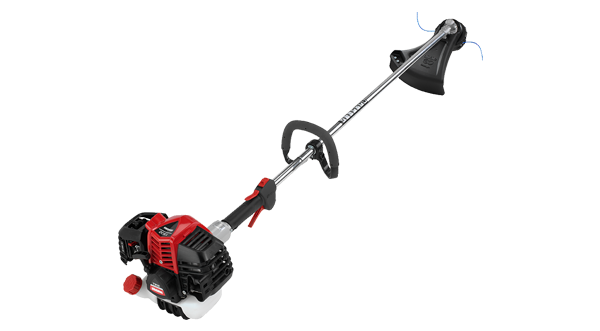 Since it’s built specifically for edging instead of adapting a string trimmer design, Shindaiwa was able to add features that make it more effective and easier to use. The flex cable drive allows the LE262 to use a curved shaft for clear sight lines and better ergonomics. Captive wheel mount hardware makes it easy to adjust wheel height, and since it can’t be removed, there’s no chance of losing the nut or washer when moving the wheel. A powder-coated aluminum debris shield deflects pebbles and other debris thrown up by the blade, while an extended skid plate lasts longer than standard blades. The drive has a 2:1 ratio gear case for added torque to cut through overgrown grass and compacted dirt. Like all Shindaiwa products, these new machines are covered for 5 years of consumer use or two years of commercial use. The flex drive cable comes with a limited lifetime warranty. Whether you’re a homeowner or a landscape professional, you can get the equipment and service you need at Shank’s Lawn Equipment. We’re more than just an authorized Shindaiwa dealer: we have a massive warehouse that lets us keep most parts in stock for quick repairs. Our shop is at 4900 Molly Pitcher Highway in Chambersburg, PA. To get here from Interstate 81, Take Exit 10 to Marion and drive East one mile. Not in the area? We ship OEM Shindaiwa parts across the U.S. and Canada. To order, visit us online at www.shankslawn.com. BCS’s walk-behind tractors can be set up to do a wide range of tasks, but they’re known first and foremost as powerful tilling machines. If you just got a tiller attachment, there are some things you’ll need to do to set it up and attach it to your tractor. The oil level should be checked before use in case there was some leakage during transport. 1. Support the drive shaft so that it’s parallel to the ground. 2. Remove the two 8 mm bolts connected to the top center of the tine assembly. One bolt connects the depth control assembly to the tines, and the other goes through the tine assembly cover. 3. Pivot the cover forward. This will give you access to the gearbox. 4. Remove the plug on the top of the gearbox. 5. Get a stick or other small object and make a mark on it 4 inches from the tip. Drop the stick into the hole until the mark lines up with the top of the case. 6. Measure the distance between the mark and the oil level. If the case is properly filled, the distance should be about two inches. If the oil level is low, add SAE 80-90 EP (Extreme Pressure) gear oil. Do not overfill: the air space keeps internal pressure down during operation. If there’s too much oil, it will increase internal pressure, pushing the oil past the seals. Now is a good time to check the tightness of the bolts on this attachment, paying particular attention to the tines. There are also 22 mm bolts deep inside the center of the tine shafts that are easy to miss. You’ll need a ratchet with an extension to reach these bolts. Next, flip the hood forward and reinstall the two 8 mm bolts. Leave the bolt connecting the depth control lever slightly loose so the bar can pivot. Pull up on the depth control rod and push the spring pin on top of the cover into the third hole from the top of the rod. 1. Cut ¼ inch of material off of the small ends of the rubber bushings. This will make them easier to fit. 2. Remove the washers and cotter pins from the prongs on the cover. Apply a spray lubricant to the prongs and the bushings. 3. Slide the bushings into the holes on the rear cover with the wide, rolled end facing to the left. 4. Slide the rear cover onto the prongs from right to left. Install the washers and cotter pins. While optional, most tiller attachments will come with a quick coupler. To mount this coupler, you’ll need a 10 mm hex wrench and 9 mm open-end wrench. 1. Remove the male tang from the QH bushing by flipping the lever on top of the bushing. 2. Remove the nuts and washers from the bolts mounted on the tang. 3. Slide the bolts through the holes on the driveshaft cover, mating the tang with the driveshaft. The hole in the tang should be pointed up. 4. Install the nuts and washers, getting them hand tight. 5. Attach the QH bushing. The heads of the bolts will fit into the holes on the bushing, lining everything up. Tighten down the bolts. 6. Remove the QH bushing and reinstall it to make sure the bolts are properly aligned. 7. Remove the QH bushing again and apply spray lithium grease or an anti-seize lubricant to the outside of the tang. Shank’s Lawn Equipment is an authorized dealer for BCS as well as their manufacturing partners, which means we’re able to sell and service everything on your tractor. If you’re looking for tractors, attachments or parts, visit our shop at 4900 Molly Pitcher Highway in Chambersburg, PA. That’s one mile east of I-81 via Exit 10. We also ship parts across the U.S. and Canada. To order, visit www.shankslawn.com. As commercial engines switch to electronic fuel injection, they’ve added control systems that offer engine management and diagnostic tools similar to what automakers have offered in cars for the past 30 years. 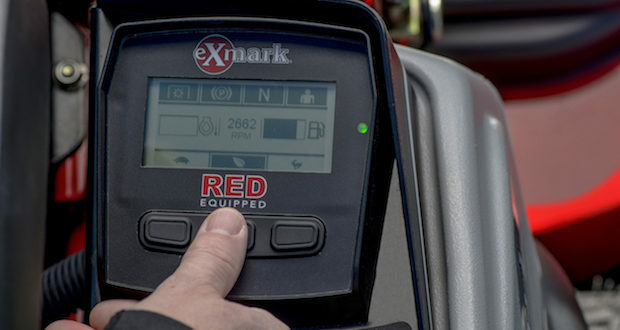 Exmark took that a step further with RED technology, working with the engine’s ECU and other mower components to improve performance and make their mowers easier to use. Their second generation system adds more features and works with more models, improving performance, reducing fuel consumption, decrease wear and simplifying troubleshooting. In 2013, Exmark rolled out a new electronic control system for mowers equipped with Kohler EFI engines under the “RED Technology” brand. On the surface, it may have looked like nothing more than a digital gauge and hour meter, it used a control unit that works with the engine, PTO and drive system to improve efficiency and reduce wear. The new second generation system adds better controls and more functions to reduce throttle droop, identify problems before they become expensive to repair, and reduce overall running costs. It also works with more engines. Like the first generation system, RED handles the throttle automatically. The engine can be operated in three RPM modes: Low, Efficient and Max. Low helps the mower handle wet, dense grass without deck build-up, Max provides maximum power to handle dense growth, and Efficient is perfect for normal mowing. This new update lets each mode can be used with or without the PTO engaged. The clutch saver reduces engine RPM automatically when PTO clutch engages to reduce wear and allows the deck to be engaged while in motion. RED also has an automatic idle mode that engages when the operator leaves the seat, and a new throttle-down mode reduces RPM when mowing near objects that are easy to damage like cars, windows and landscape features before returning to the previous operating mode. If there’s a problem with the mower, like overheating, safe transport mode disengages the clutch and reduces engine speed to limp the mower back to the trailer. The new system has an LCD display with three multi-function buttons in place of the rocker switch on older RED control panels. During normal use, the display tracks total fuel usage, average fuel consumption per hour, and both fixed and resettable engine and PTO hour meters to keep track of maintenance. The system also tracks machine health and displays notifications for engine and transmission oil service intervals. It also displays error and troubleshooting codes on screen for easy reference. These codes and the mower’s service history are logged, making it easy for owners and repair technicians to troubleshoot issues. Which Models Come Equipped with RED Technology? 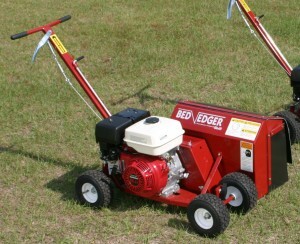 Second generation RED Technology is available on Lazer Z ZTR mowers with EFI-equipped Kawasaki and Kohler engines. It’s also included with Yanmar-powered Lazer Z Diesels, making this the first time RED has been available on a diesel mower. This covers a wide range of ZTRs with deck options ranging from a 52-inch constructed deck to the 96-inch flex wing deck, making this system available on mowers that fit a wide range of commercial needs. Is an Exmark ZTR Right For You? Shank’s Lawn Equipment is an authorized Exmark, Kohler, Yanmar and Kawasaki dealer, which means we can offer the support you need for your professional mower. If you need a new ZTR or you need your current Exmark serviced, visit us at 4900 Molly Pitcher Highway in Chambersburg, PA. To get here, take Exit 10 to Marion from I81. Need parts? We can ship what you need to any address in the United States or Canada. To order, visit us at www.shankslawn.com. For the outdoor equipment industry, the Green Industry and Equipment Expo, or “GIE+,” is equivalent to the Detroit Auto Show or CES, showcasing the latest models and innovations. Echo went big this year, showing off three industry-leading products: the most powerful backpack blower on the market, the most powerful handheld blower on the market and the company’s first hardscape saw. Here’s what you can expect from these new machines as they reach the market this year. This leaf blower has an all-new 79.9cc engine that gives the fan enough power to output 1,071 CFM at 211 MPH with 44 Newtons, or about 10 lbs, of force. That’s 7% more power than any other backpack blower available today. The high output alone would be noteworthy, but it also uses the industry’s first carbon fiber plastic frame and fan case. Echo says this switch reduced the PB-8010’s weight by about two pounds. Even with the bigger engine, it tips the scales at 24.5 lbs, which is about the same as the smaller PB-770T. The fan and engine are mounted on a padded, vented back designed to draw air across the operator’s back on its way to the fan chamber to help them stay cool. Air exits a 3.6-inch wide blower tube that has a wear ring, letting you know ahead of time when it’s due for a replacement. This blower is available as the PB-8010 with a tube-mounted throttle and as the PB-8010H with a hip-mounted throttle. Handheld blowers are mostly used by homeowners handling small jobs, but they can be invaluable to commercial landscapers who need to do cleanup in tight spaces. Despite its size, this new lightweight commercial blower moves 456 CFM at 172 MPH, delivering 15.8 Newtons (3.5 lbs.) of force. The engine has all the features you expect from a commercial device including a hard-wearing chrome-plated cylinder and paper filter surrounded by a foam pre-filter. It’s also designed to deliver best-in-class hot restartability. A rubber main handle quells vibrations, while the secondary handle holds the throttle controls, including a variable locking cruise control. The round pipe has a wear indicator like their new backpack blower along with a flared end pipe for peeling up layers of packed down leaves. This heavy-duty handheld circular saw is built to cut through bricks, pavers, stepping stones and cultured stones for landscaping installation, and since it’s hand-held, it can be used on installed landscape features. The 73.5 cc two-stroke engine delivers the highest torque of any engine in its class, and its high maximum RPM lets it use a low 2.6:1 drive ratio without reducing blade speed. A spring-assist starter, decompression valve, automatic fast idle and fuel purge bulb work together to make starting easy. Since this machine will be covered in dust while it’s working, Echo fitted the engine with a four-stage air cleaner. The reversible cutting arm lets the CSG-7410 be used for standard cutting or close cutting near buildings and obstacles. A stainless steel shield deflects dust, while the aluminum handle has a rubber grip to reduce the transfer of vibrations to the operator. There’s also a standard water kit to keep the blade cool when cutting through hard materials. A 14-inch masonry abrasive wheel is included from the factory, and it can use a variety of other blades thanks to 20 and 25.4 mm arbors. Shank’s Lawn Equipment is more than just an Echo dealer. We’ve been in business for over 35 years, selling and supporting the equipment professional landscapers depend on. If you’re looking for new lawn care equipment, or you need parts or service for your current equipment, visit our shop at 4900 Molly Pitcher Highway in Chambersburg, PA. To get here, take Exit 10/Marion from I-81. We can also ship the parts you need for your Echo equipment to any address in the United States or Canada. To order, visit www.shankslawn.com. When you need to do serious snow clearing, a big, purpose-built snow blower may be out of your budget, or simply too small to be up to the task. However, if you own a tractor, you may be an attachment or two away from having all the snow moving capability you need. Here are some ways you can equip your tractor to clear snow. A standard blade can be used to push snow around, gathering it into a pile, but it’s not an ideal solution. The metal edge can damage sensitive surfaces including brick paths and granite walkways, and the blade shape and angle can keep it from pushing snow effectively. You may find that you have to constantly overlap passes to pick up snow that spread out from the blade on the previous pass. Snow blades are shaped to roll the snow more effectively, and often have coatings that keep snow from sticking. They also come with plastic blade edges and skids that won’t damage pavement. By adjusting the skid height, you can have the blade scrape close against ice or push snow without picking up gravel. Snow blades also have articulation to angle them left or right. This rolls and pushes the snow to the side of the machine. Cheaper options will skip the hydraulics, requiring the operator to stop the machine to make adjustments. Depending on your tractor, you may need to add a front mount to use a blade, increasing upfront cost. However, this is still the most cost-effective option for snow clearing. Single stage blowers have a single, high-speed auger that picks up snow and pushes it through a chute. Two-stage blowers have a slow speed auger that picks up large chunks of snow which are fed to a high-speed fan or impeller that breaks the snow into powder and pushes it through the chute. When it comes to purpose-built machines, single stage blowers are limited to small jobs, while two-stage snow designs are the standard for commercial and large residential jobs. However, the added power of your tractor means that single stage attachments can remove snow as well as larger two-stage blowers without the added complexity and cost of an impeller. 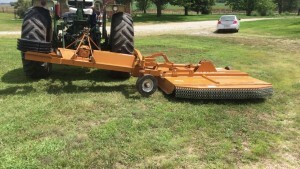 Two-stage attachments also have an advantage over stand-alone snow blowers because they use a chain drive to connect the auger to the transmission instead of using a gearbox between the auger and the fan. This makes them more durable and increases the amount of auger contact across the machine. Chute controls are optional on most attachments, letting you choose between electric or hydraulic assist to best fit the power sources available on your tractor. These attachments are almost always rear-mounted, so they’re a little more difficult to operate than blades. However, their snow clearing ability easily surpasses walk-behind models, and since most models can throw snow 30-40 feet, you won’t need to overlap your passes to create a pile like you do with a blade. For heavy accumulation, Woods makes attachments with two augers stacked on top of each other, increasing working height while keeping the overall attachment size small. 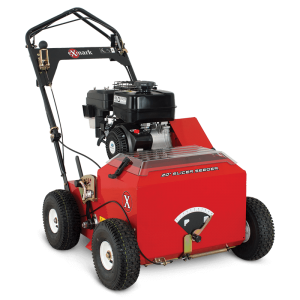 BCS walk-behind tractors can be used with the PTO facing front or back, so the snow blower attachments they offer are front-mounted, making operation similar to a standard blower. These attachments can match or exceed the performance of the largest stand-alone blowers, but they’re limited to use on the company’s larger models. Can you use the bucket on your front end loader to move snow? Yes. Is it a good idea? Usually not. There’s no way to angle the bucket side to side, so the snow has to be repeatedly scooped and pushed to pile it up, increasing job times. It’s also hard to keep the bucket consistently above the ground without missing snow, which inevitably leads to lawn and even pavement damage. Unless you need to clean up a pile of snow gathered using other cleanup methods, you should avoid using your loader. A snow blower or blade can get 99% of the snow, but the remaining layer can pack down, turning into ice. Power sweepers use flexible bristles that can scrape against pavement, removing remaining snow, whether left over from larger removal equipment or light precipitation. Shank’s Lawn Equipment has helped homeowners and commercial customers with their snow moving equipment for over 35 years. We’re a dealer for several major snow blower, tractor and attachment brands including Yanmar, BCS, and Woods so we can help you find the right combination of equipment for your snow clearing needs. Our shop is located at 4900 Molly Pitcher Highway in Chambersburg, just off route 11. To get there from I-81, take Exit 10 to Marion. Do you need parts for your snow clearing equipment? We ship across the U.S. and Canada. To order, visit www.shankslawn.com.